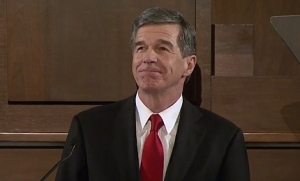 In case you missed it earlier this evening, a three-judge panel appointed by state Supreme Court Justice Mark Martin has side once again with Governor Roy Cooper in his latest lawsuit Republican lawmakers seeking to diminish his powers. The judges voted 2-1 to issue a temporary restraining order against a new law enacted this week over Cooper’s veto that would, among other things, lessen Cooper’s powers to oversee state elections. “The Plaintiff is likely to sustain irreparable harm unless a temporary restraining order is issued and, in the opinion of the Court, the issuance of a temporary restraining order is necessary for the protection of the Plaintiffs rights during the course of this litigation. Violations of the North Carolina Constitution constitute irreparable harm as a matter of law. The destruction of the State Board of Elections and State Ethics Commission and their replacement with the new, unconstitutional Bipartisan State Board of Elections and Ethics Enforcement also constitute irreparable harm. A temporary restraining order is not a final order in the matter, of course, but it does mark the latest of several court victories won by Cooper and his lawyers at the expense of GOP lawmakers. Sadly, one senses this will be far from the final chapter in the ongoing Republican power grab saga.